Is Brad Angie's Boy Toy? Star magazine provides much of the inspiration for the work I post on this blog. 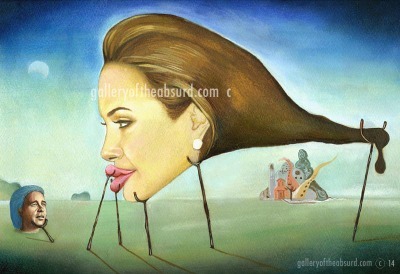 I flip open the magazine and find endless amounts of material to fuel my absurd paintings of celebrity gossip. 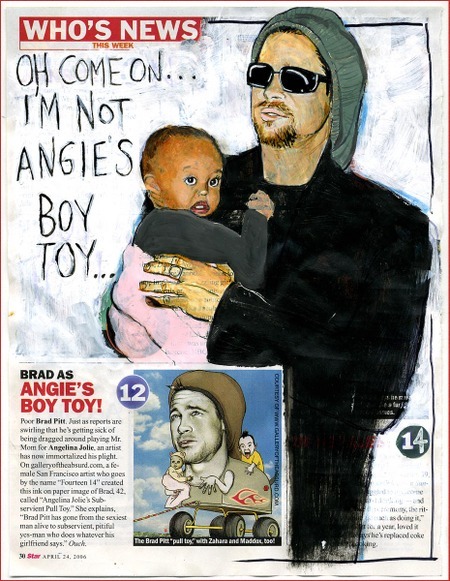 They were kind enough to print my Brad Pitt Pull Toy in their News of the Week feature.....so of course I had to create a painting out of it. Here we see Brad disagreeing over his portrayal as Angie's boy toy. Medium: Acrylic and ink painted directly onto page 30 of the April 24 issue of Star magazine. An article in the Sunday Edition of the NY Post reports Thomas Kinkade, America's Most Successful Living Artist, urinated on a Winnie the Pooh figure outside the Disneyland Hotel in Anaheim. Kinkade might be known for his paintings of wholesome candy-colored blobs of heavenly "light", but he'll go down in history as more of a "lifestyle marketer" than "artist". He's a rock star in the eyes of his collectors (which are mostly female) and he knows exactly how to seduce his rapt audience into buying the useless landfill trinkets his company spews out regularly. He's such a marketing genius that he'll even take his urinating on Winnie the Pooh fiasco and turn it into a profitable endeavor. 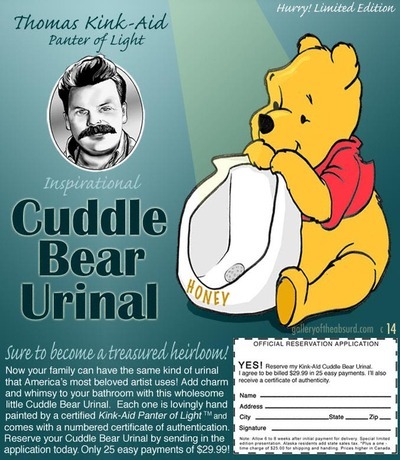 The Thomas Kink-Aid Cuddle Bear Urinal is my vision of what this product might look like. To see a more R-rated version of a Thomas Kinkade trinket I did a while back, click here. Read more about Kinkade's empire here. Thank you Holly for the tip. UPDATE: Winnie the Pooh was just awarded a star on the Hollywood Walk of Fame. Don't tell Thomas Kinkade! 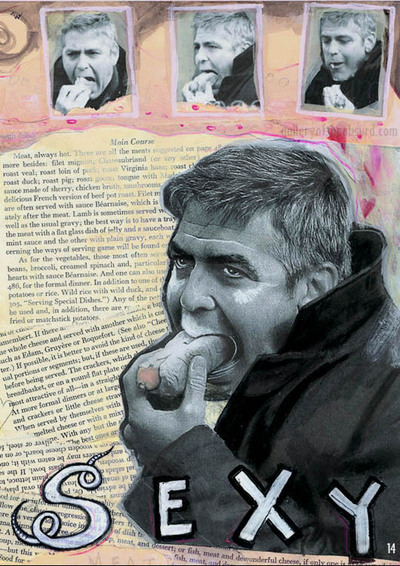 A few weeks ago, Star magazine ran a large photo of George Clooney stuffing a huge hotdog in his mouth. I wasn't planning on purchasing the magazine, but when I saw the photo, I had no other choice but to buy it. They really should have put this photo on the cover, sales would have skyrocketed. Medium: mixed media collage. This is a comic I drew a few years ago and after looking at the Handsome George Clooney photo above, I thought it was relevant to post. Look, I'm not saying ALL guys eat like this, I just happened to witness this sort of behavior in the course of a single day (and yes, that's Jeff Polage in the first panel). I've enjoyed many male dining companions who were well-mannered gentlemen...but they don't make as funny a comic strip as the sloppy guys do. Oh, and while we're on the subject of eating, don't miss this site devoted to photos of celebrities eating. Why it exists, I can't explain. Even if you manage to avoid developing brain cancer from using your mobile phone, you still have to worry about the possibility of an angry Naomi Campbell hurling one at your head. One of the largest mobile device makers has teamed up with the aging supermodel to introduce the most fashionable phone to ever hit the runway. 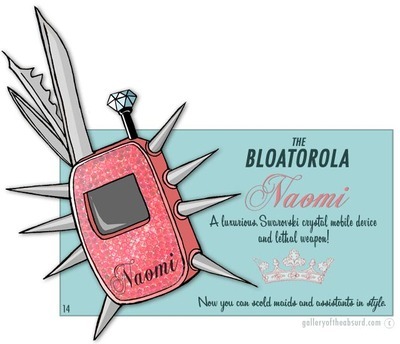 Studded with sparkling pink Swarovski crystals and featuring an exclusive 3 carat diamond, no one would guess that with a push of a button, this innocent little phone becomes a dangerous Ninja shuriken. The antenna doubles as a grenade pin...just pull and toss at your enemy! A set of Swiss army knives are also included, along with a high quality nail file and secret lipstick compartment.